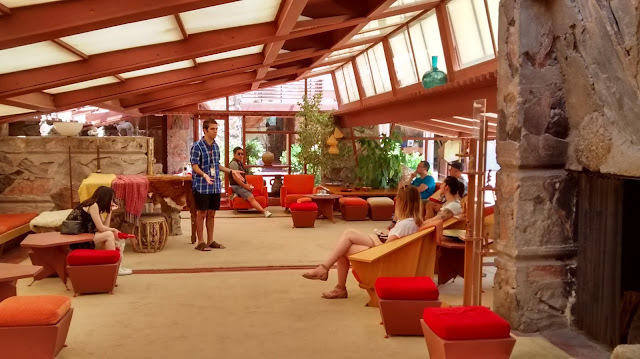 Our tour guide (in the plaid shirt) shared lots of fun and weird stories with us about the house and the quirky genius of Frank Lloyd Wright. Here is the main room used for parties. Frank Lloyd Wright had several pianos throughout the property and this one (behind the guide) was frequently played by Wright. All of the furniture in this room (except the piano) is replicas of the originals. Canvas panels were installed here to diffuse the light just as they were used in the studio and elsewhere. I used to be a flight attendant for a small airline that flew into Madison, Wi. Often FLW would board the plane to Chicago to fly elsewhere and he was a grumpy passenger!